Incredibili pitture rupestri preistoriche scoperte e filmate in Colombia grazie ad una troupe in elicottero. L’aera della Colombia in cui sono state trovate è estremamente remota e questa è la prima volta che queste pitture vengono riprese o fotografate. Centinaia di animali e cacciatori sono stati dipinti in ocra rossa in un riparo all’interno del Chiribiquete national park. La mano di un artista sconosciuto del passato è riuscito a ricreare immagini di giaguari, coccodrilli e cacciatori danzanti di estrema naturalezza. “A British wildlife film-maker has returned from one of the most inaccessible parts of the world with extraordinary footage of ancient rock art that has never been filmed or photographed before. The extraordinary art includes images of jaguar, crocodiles and deer. They are painted in red, on vertical rock faces in Chiribiquete national park, a 12,000 square kilometre Unesco world heritage site that is largely unexplored. There are also paintings of warriors or hunters dancing or celebrating. “It is the land that time forgot,” Slee told the Observer. Slee used a helicopter to gain access to the area, as the terrain is impenetrable – thick vegetation, forested rock peaks and valleys, sheer cliffs and giant rock towers soaring through a rainforest canopy. 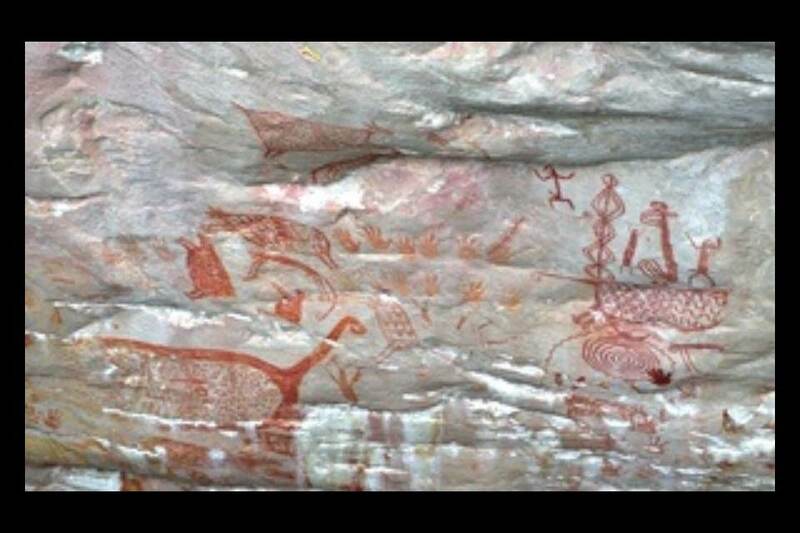 Professor Fernando Urbina, a rock art specialist from the National University of Colombia, was struck by the “magnificent naturalism” of the depictions of deer when shown the photographs.